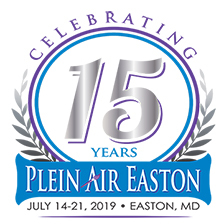 Plein Air Easton’s Quick Draw Competition (this year held on Saturday, July 21st) is the most exciting event held within the week. In this fast-paced skilled painting competition, any artist with $10 and ambition has 2 hours to turn a blank canvas into a completed painting. The event has been known to have as many as 200 artists vying for any patch of shade to produce their best work surrounded by crowds of people strolling through the streets. It can be both exhilarating and frightening to even the most seasoned artists. To soothe fears of painting in front of crowds and completing a painting in two hours or less, Plein Air Easton partnered with Chesapeake Fine Art Studio to develop ‘Rehearse Quick Draw’. This is a chance for any artist to take a practice run before Saturday’s big event and is open to all ages. Artists will register and check in at the Avalon Theatre between 9am-10am on their designated day and then paint within the Quick Draw’s geographic bounds between 10am-12pm, without the crowd expected on Saturday. Instructors from Chesapeake Fine Art Studio will provide feedback during painting time. At 12:30pm, the participating artists will gather in the air-conditioned Avalon Theatre for a structured critique of works created that morning. Space is limited for each class and will sell out. Register online TODAY.